Conditions Governing Access: Catalogued imagery is available on the NCAP website. Uncatalogued imagery is only accessible with knowledge of exact sortie references. The Defence Geographic Centre (DGC) provides geographic information to UK defence and government departments. It delivers this through mapping, aeronautical charts, geo-referenced aerial imagery and digital data. The DGC collection contains over 2,000 aerial photographs of locations around the world, dating from 1924-1945. The photography was taken by the Royal Air Force and Royal Navy for the Geographical Section, General Staff (GSGS). GSGS then used the photographs to provide a baseline for the creation of maps, for issue to British and Commonwealth forces. The historical aerial photography held by DGC was transferred to NCAP in 2017. 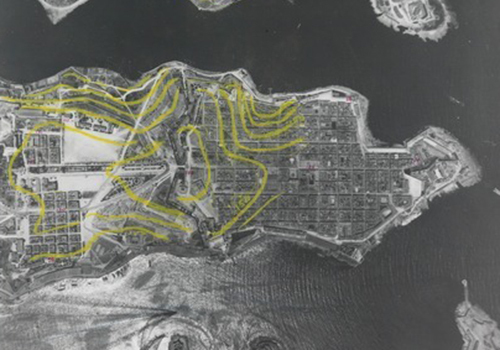 An example image from the DGC Collection, showing contour annotations on imagery of Valletta, Malta, in 1927. Territories covered by photography in the collection include Egypt, Hong Kong, Libya and Malta. As photography from this collection is catalogued and digitised, it is uploaded to our website. View all of our digitised DGC imagery.